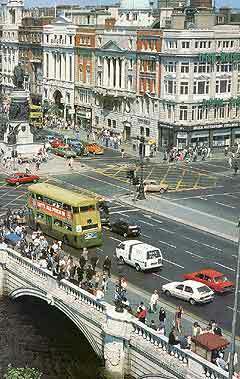 Dublin, Ireland's capital city, lies on Dublin Bay and overlooks the Irish sea that divides Ireland and Great Britain. The city ranks among the top tourist destinations in Europe and in the last couple of decades there has been an economic boom, which has seen areas of the city change dramatically. Many historical areas have been rejuvenated and restored, new shopping centres have arrived along with restaurants, clubs and bars, making this a very exciting place to stay. Much of central Dublin is filled with beautiful period buildings with elegant Georgian architecture. This city is unfortunately a fairly expensive place to look for accommodation, especially during the busy peak season, between the months of May to September. Hotels are at their most pricey on the southern side of the River Iffey, where central locations include O'Connell Street, Temple Bar and Trinity College. However, the relatively recent addition of the city's popular Luas tramline now means that cheaper hotels within the city's suburbs are far easier to reach. Several official tourist information outlets are located in the city, with the Dublin Tourism Centre being based on Suffolk Street, within St. Andrew's Church. 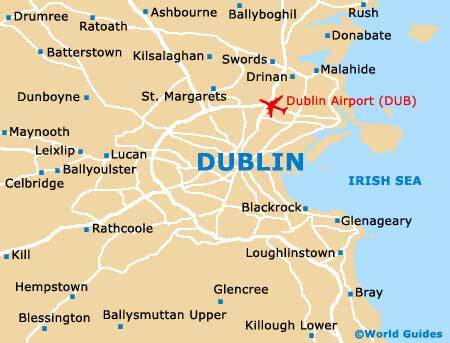 Further tourist centres reside along Upper O'Connell Street and Wilton Terrace, and also at the arrivals hall of Dublin Airport and at the outlying Dun Laoghaire ferry terminal. As with Paris, London and so many other cities throughout the world, a large river runs right through the heart of Dublin. The River Liffey splits the city into the 'north-side' and the 'south-side', and all major attractions are within walking distance in this compact area. Two canals, the Grand Canal in the south and the Royal Canal in the north, form semicircular arcs around the centre. To the north of the river, the most notable Dublin streets are O'Connell Street, which is the major shopping area, leading to Parnell Square and Gardiner Street. 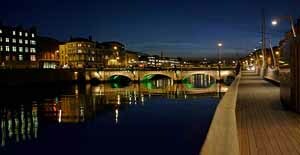 There are many places to stay throughout the city and hotels vary greatly in price, mainly depending upon the location of the accommodation and its relatively proximity to both the Liffey and the city centre. To the north of the River Liffey is the popular and trendy area of Temple Bar, where you will find a large concentration of pubs, restaurants, cafés, shops and art galleries. As evening approaches and the shops begin to close, Dublin's Temple Bar transforms into an exciting party hotspot with a very friendly atmosphere. Nearby is the well-known Trinity College and Grafton Street, full of large, exclusive shops. To the south there are many truly wonderful examples of Georgian houses, stately homes and elegant parks. Some of the best known monuments and landmarks include the National Museum of Ireland, Castletown House, the National Gallery, St. Patrick's Cathedral, Powerscourt, Custom House and Christ Church Cathedral - all well worth a visit. Amongst the many Dublin sightseeing opportunities, the Guinness Storehouse has quickly become the most popular tourist attraction in the city. Guinness stout, a dark brew made with roasted malt, is not only served in every single pub throughout Ireland, but is enjoyed throughout the world, where a staggering 10 million glasses of Guinness are bought each day. Dublin's Phoenix Park is simply vast, twice the size of New York's Central Park and almost five times as large as London's Hyde Park. It is home to many attractions, including the Irish White House - official residence of the Irish president, Dublin Zoo - an animal haven containing many paddocks, the incredibly tall Wellington Monument, and large areas of open parkland, with ideal spots for relaxing picnics or playing sport. More information about Dublin Tourist Attractions. In a recent survey, the prosperous city of Dublin appeared in the top ten of the world's most livable cities. The friendly, hospitable nature of the people that live here, together with the beautiful setting and easy accessibly, all contribute to this being a truly first-class holiday destination.